I've gone astray. When it comes to choosing food at a restaurant I've always had a preference for tasting menus. Firstly because I'm greedy, but more importantly, it will usually give you the most intense and broad experience in a restaurant; in some cases you did make that special journey after all. It also has to do with value for money and in countries such as Spain, the Netherlands and the UK, it does pay off to go for the tasting menu. During my last trip to France I went "à la carte" as much as possible and I'm glad that I did. I have found that in French three-star restaurants, especially in Paris, you get an equally intense experience as you would with a tasting menu, and perhaps even more so. My à la carte meals were all delightfully uncluttered affairs; starter, main, dessert, sometimes supplemented with a cheese course, but more importantly you can pick exactly what you want. All this doesn't mean that I'm off the tasting menu, and I've certainly never experienced them as tyrannical, but it's nice to have a choice. Some chefs like Bjorn Frantzén at Frantzén, Eneko Atxa at Azurmendi, and Heston Blumenthal at the Fat Duck, are masters at designing dishes for tasting menus. In fact, their tasting menus are an essential element of the experience, and I can't imagine that a destination restaurant such as Fäviken would even work without a tasting menu. That said, I do believe that the food of more traditional chefs, can best be savoured in à la carte portions, and for more modern chefs the "tasting menu only" concept can also be quite limiting. Just two weeks ago London two-star chef Claude Bosi of Hibiscus posted a video of him setting fire to a tasting menu on Instagram, with the text: "That's it the tasting menu only its finished we tried and didn't like it...!! back to the old 3course as well as tasting menu to give back the choice to the customer". If you ask me, he could be on to something. Parisian three-star restaurants are notoriously expensive, with tasting menus generally starting around €300, the extremes being l'Astrance, whose tasting menu is priced at €230, and Guy Savoy on the other side of the spectrum, whose most extensive tasting menus is priced at €490. The lunch menus are usually the more affordable option, think around €130-€150, with the €70 lunch menu at l'Astrance being a pleasant exception. The a la carte prices are not much different; a 3-course meal with an extra cheese course will probably set you back around €250. But hey, Adele and Beyoncè concert tickets don't come cheap either, right? 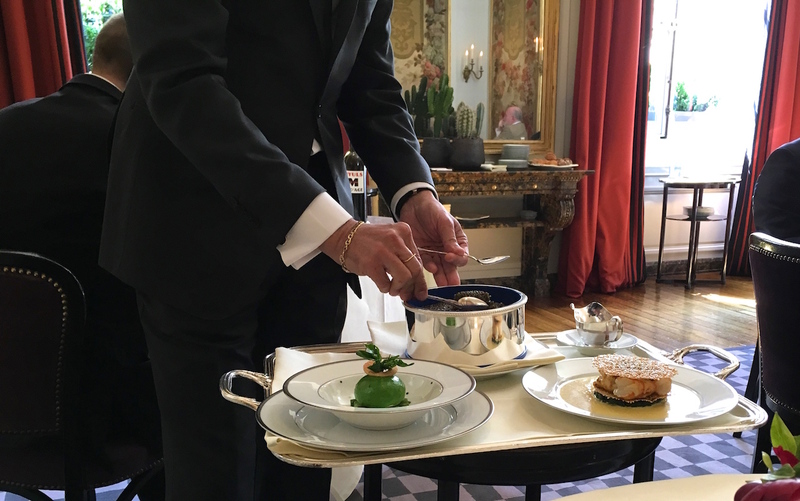 There's no way to sugarcoat it: if you're going to a three-star restaurant in Paris you need to bring your biggest credit card. Three-star restaurant l'Ambrosie in Paris is (in)famous for two things: the restaurant has held three Michelin stars since 1988 (therefore Paris' longest running three-star restaurant) and it's an à la carte only restaurant. A meal at l'Ambroisie comes with a premium price tag: starters are priced at €74-€128, fish mains at €115-€148, meat mains at €92-€135 and desserts at €32-€49, but this is still in line with other three-star restaurants in Paris and in France in general. But to put things in perspective, in 2012 I had a 14-course tasting menu at Celler can Roca for little more than the price of the most expensive main course at l'Ambroisie. Chef and owner is Bernard Pacaud (b. 1947) who runs the restaurant together with his wife Danièle. The couple opened l'Ambroisie in 1981 at 65 Quai de la Tournelle on Paris' left bank and the following year the restaurant was awarded its first Michelin star; the second star followed in 1983. In 1986 l'Ambroisie moved to its current premises on the Place des Vosges in the 4th arrondissement. Pacaud received his training at some of France's most famous restaurants, including La Mère Brazier in Lyon and La Coquille and Le Vivarois in Paris. 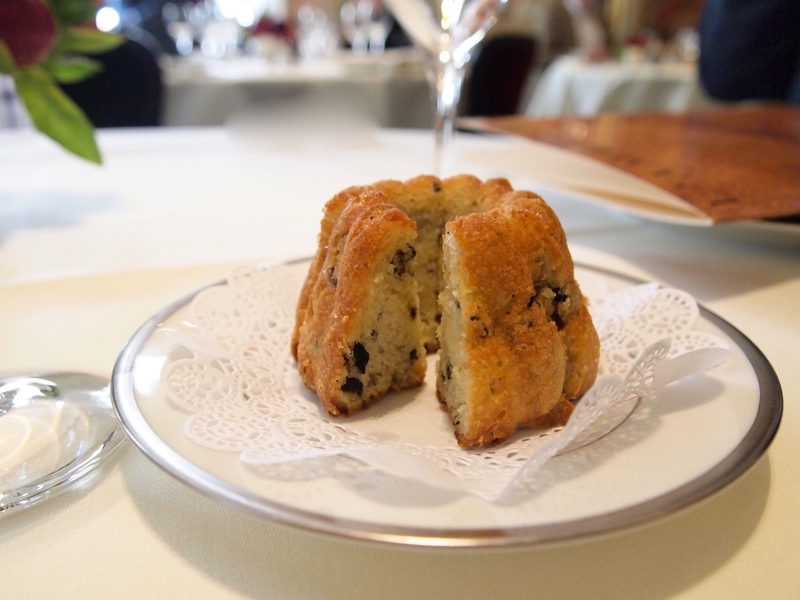 I had lunch with my husband at l'Ambroisie on Wednesday 27 April 2016 and our meal started with an aperitif, accompanied by a superb Kugelhopf brioche flavoured with onion and black olive. Deciding on the menu wasn't an easy task today. The menu at l'Ambroisie is packed with iconic Pacaud dishes. The "Feuillantine de langoustine aux graines de sésame, sauce au curry" starter is legendary, as is the "Chaud-froid d'œuf mollet au cresson, asperges au caviar golden". 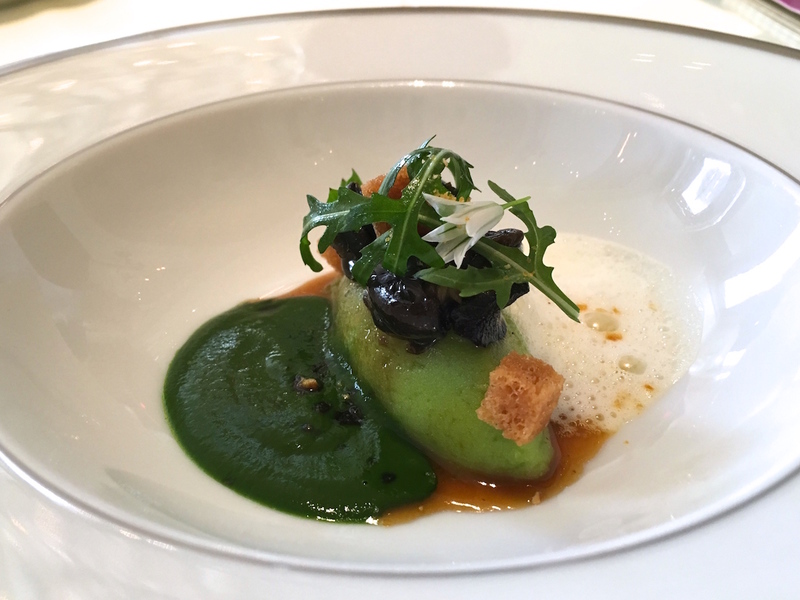 But wait, "Parmentière d'escargots "primavera", coulis d'ail des ours", that sounds great too, and what better place to eat snails than in a Parisian three-star restaurant. I had already decided on my main, even before I entered the restaurant: "Navarin de homard aux pommes de terre et romarin, jus réduit de crustacés", but I couldn't decide on my starter (the egg or the snails). Luckily the restaurant kindly offered to serve an amuse-bouche version of the snail dish. So here we go. The à la carte snail starter is served with a large helping of potato puree (hence Parmentier), but my amuse bouche was a lighter version with a lovely, intensely flavoured wild garlic puree, a light, herb flavoured "parmentier", some delicate and tender snails, an elegantly flavoured garlic foam, and garnished with rocket and croutons. An excellent amuse bouche with balanced, but distinctive flavours and great textures. This was followed by "Chaud-froid d'œuf mollet au cresson, asperges au caviar golden". 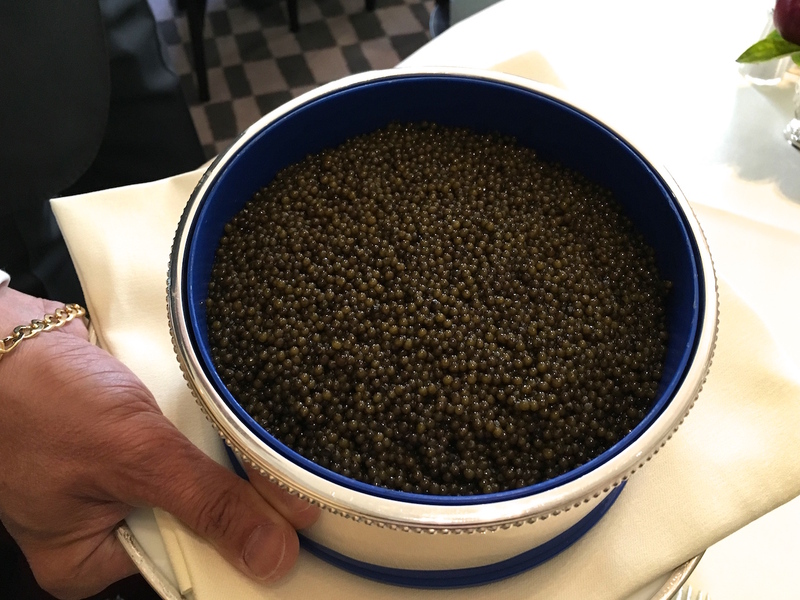 When it comes to caviar, they don't mess around at l'Ambroisie. The restaurant uses farmed Oscietra gold caviar from China. Yes 'Made in China', but don't be fooled by this label: China's aquaculture caviar farms are considered some of the finest and purest in the world. 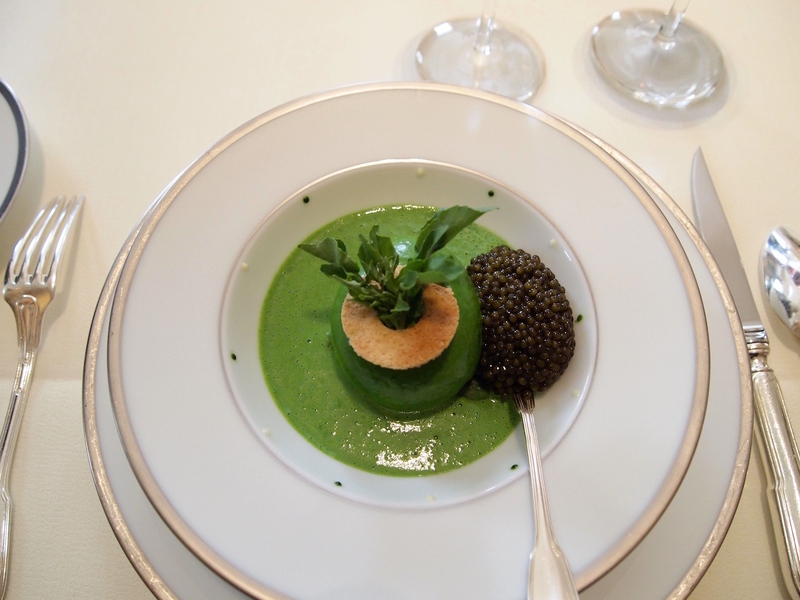 Anyway, an imposing amount of this glorious caviar is served with a soft boiled egg, which is coated with a strikingly green watercress emulsion, and a green asparagus nage. The egg had been expertly cooked; the yolk had just set, making it deliciously creamy and not too rich. If it had cooked any longer it would have perhaps been too powerful. Wonderful freshness and pepperiness coming from watercress emulsion, that also had an outstanding purity to it, and the asparagus nage delivered a mild, creamy sweetness to the dish. The highlight of the dish, however, was the caviar, the individual eggs having a beautifully round shape, delicate texture, and a creamy salinity. Not just an expensive ingredient as a garnish on the plate, but having a real gastronomic purpose here, because above all the caviar lifted all the flavours, creating a heavenly dish. My main course, as mentioned, was "Navarin de homard aux pommes de terre et romarin, jus réduit de crustacés". 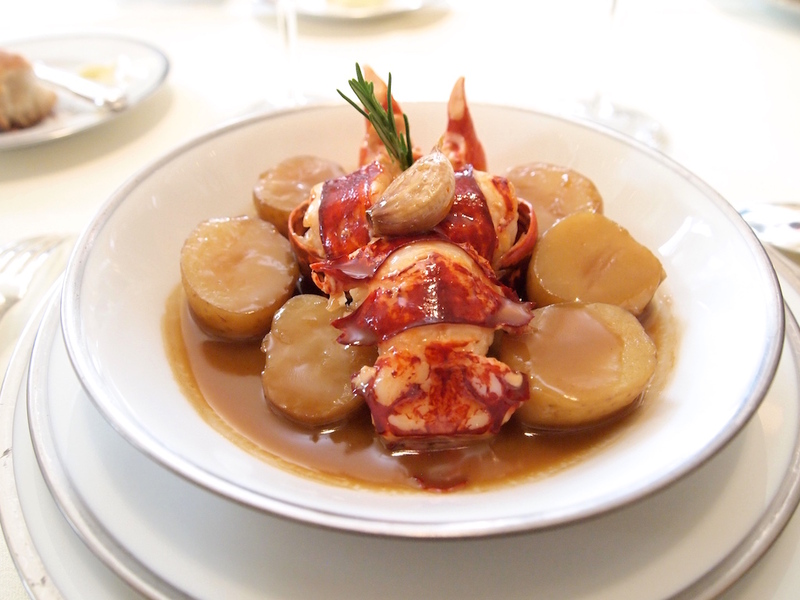 Superbly cooked Brittany lobster 'stew" (Navarin = stew) exquisitely paired with a crustacean reduction and rosemary-flavoured potatoes. A visually stunning plate with equally stunning flavours; the kind of lobster dish that's right up there with those from Michel Guerard and Eneko Atxa. The lobster was divine, sweet, succulent, and the potatoes were wonderful, with just a hint of rosemary. Best of all, though, was the buttery reduction that had an incredible depth of flavour; truly sublime as if carrying the soul of all crustaceans that have ever passed through the kitchen of Pacaud. Also on the plate was some confit garlic, which, once mixed in the reduction, brought an additional dimension to the plate. Next up was palate cleanser of lemon sorbet, meringue and strawberry coulis, which was nice and refreshing and it certainly revived the taste buds. 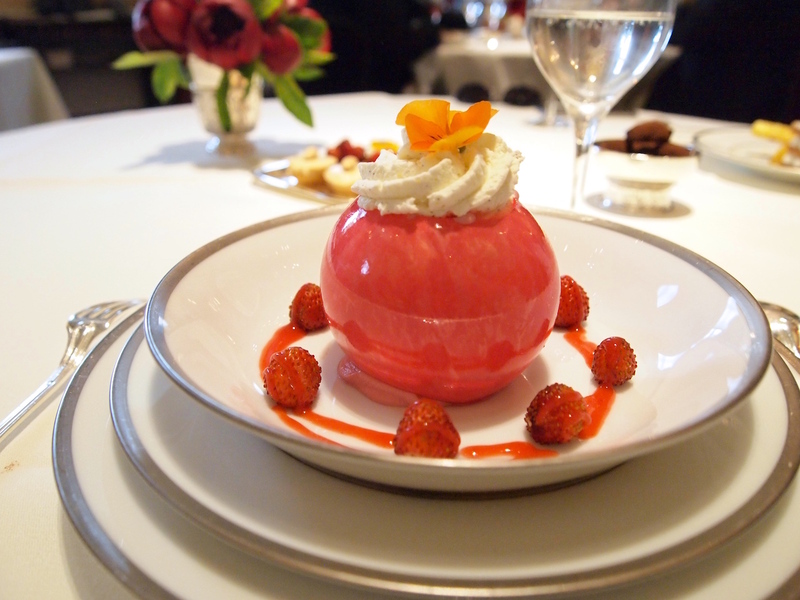 Dessert was "Boule nacrée aux fraises des bois, crème foisonnée à l'hibiscus". I did consider to order l'Ambroisie's famous chocolate tart, but the waiter suggested this strawberry dessert, and after the previous brilliant courses, I was like putty in their hands, so strawberry it was. I realise that from now on people will always ask me the question: didn't you have the chocolate tart? And indeed a good number already have. 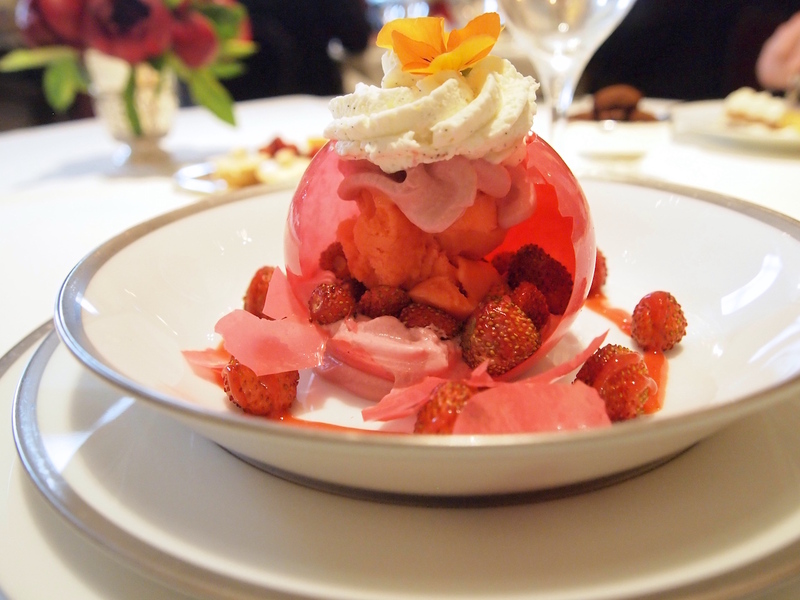 Even so, the strawberry dessert was an impressive affair of a perfectly thin strawberry sphere, topped with a dot of vanilla-flavoured whipped cream, and a filling of fresh wild strawberries, hisbiscus "crème foisonnée" and strawberry sorbet. A perfectly conceived and executed dessert with wonderfully fresh and not too sugary flavours. How do they get away with it? They name the restaurant Ambrosia, the food of the Gods. To add to this, the restaurant's website boasts (translated from the French original): "Often regarded as the most beautiful of all the three stars, restaurant l'Ambroisie is a veritable jewel of French gastronomy." They only do à la carte - no tasting menu, let alone a "lunch deal" and the website does not even bother to mention prices. If you have to ask for the price, you can't afford it, seems to be the motto here. Both on the website and in the restaurant the menu is in French only and the (senior members of) staff come across as somewhat detached - aloof even. 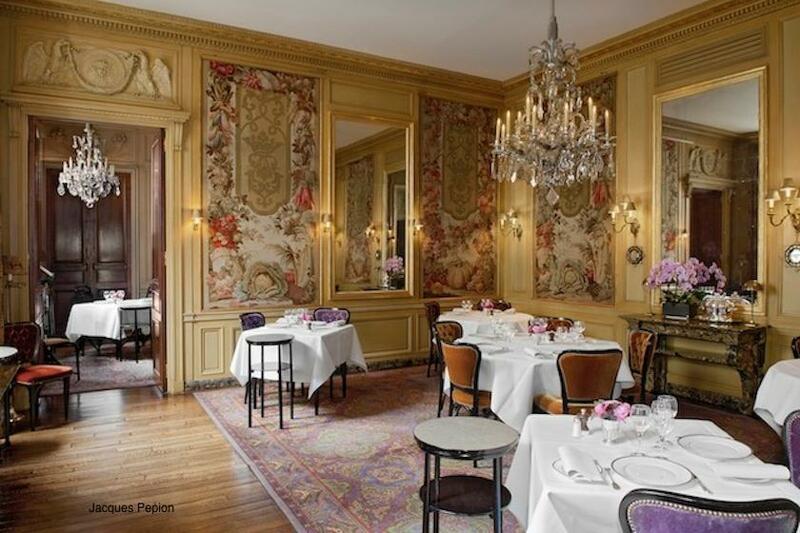 Parisian three star restaurants are often looked at as being formal and slightly snooty. I've dined extensively in Paris and I've rarely experienced this, the exceptions being Brasserie Lipp and l'Ambroisie. Maybe the arrogance is actually part of the attraction? This restaurant certainly has a big ego, but (and this is key) they can back it up. I could wax lyrical about the quality of the ingredients, but that would be pointless - any three star chef in Paris worth his salt would only use the very finest. I am not an ingredient fetishist anyway; to create food fit for the Gods, a lot more is required. The restaurant describes itself as "hors du temps", as timeless. It is certainly not one of those restaurants where constant innovation is a goal in itself, where the chef is looking for fleeting foodie favour or is deeply worried about his spot in next year's World's 50 Best Restaurants list. There is no tasting menu for a very good reason: it wouldn't work with these dishes and with this style of cooking. You need an à la carte portion to fully savour their grandeur. "Du sublime au ridicule, il n'y a qu'un pas", Napoleon once said (from the sublime to the ridiculous, there is but a step) and at l'Ambroisie perfection obviously is the norm. Flawless, authentic cooking without twists or tricks. Some people might consider this food boring and unexciting, but I will happily be bored by the very best.